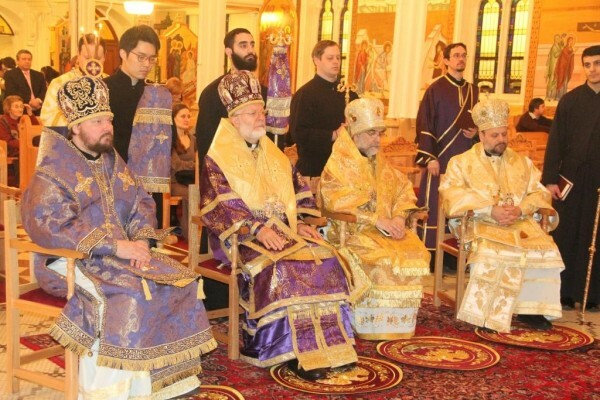 On March 1, the Sunday of Orthodoxy, Bishop Ioann of Naro-Fominsk, administrator of the Patriarchal Parishes in the USA, celebrated together with Metropolitan Joseph of New York and North America, head of the Archdiocese of Antioch, at its Cathedral of St Nicholas in Brooklyn. Among the concelebrants were also Bishop Michael of New York and New Jersey (Orthodox Church in America), and Bishop Nicholas of Brooklyn, vicar of the Archdiocese of Antioch diocese of New York. The service began with the Sunday Martins. It was followed by the Divine Liturgy of St. Basil the Great. Prayers were said in Arabic, English, Church Slavonic and Greek. After the liturgy, the archpastors celebrated the Office of the Triumph of Orthodoxy with a traditional procession with the cross and the reading of the Seventh Ecumenical Council decision on the veneration of icons. Metropolitan Joseph greeted the congregation on the occasion of the common Orthodox feast and thanked his concelebrants from fraternal Local Churches for the joy of communion in prayer. During the fraternal repast, the archpastors discussed topical issues of inter-Orthodox cooperation in the American continent and Orthodox mission in today’s world, the website of the Patriarchal Parishes in the USA reports.